Northern Virginia, which once put its faith in the federal government to provide almost unparalleled prosperity, has become a true believer in the power of the private sector. Curtailed government spending and the unlikelihood that Uncle Sam will ever return to his once open-handed ways made this conversion a necessity, of course, but the push toward a more diversified workforce is paying off. 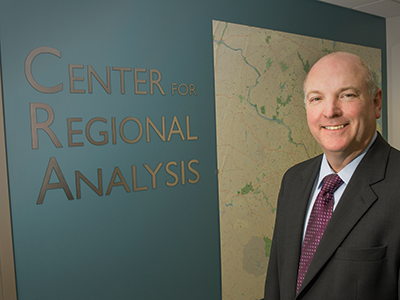 NoVa’s economy picked up momentum late in 2014 and throughout 2015, says Terry Clower, director of the Center for Regional Analysis at George Mason University. This year it is on track to being better still. The most optimistic statistic for Northern Virginia is the unemployment rate. According to GMU’s analysis center, the rate dropped from just under 4 percent in the first quarter of last year to 3.4 percent in the first quarter of 2016. That bests the most recent unemployment rate of 4.7 percent nationally and 3.9 percent in Virginia overall. Direct federal employment had next to nothing to do with the improvement. Instead, the addition of about 10,000 jobs in professional and business services during the past year delivered the economic boost, with IT, cybersecurity, and bio health particularly hot sectors. In Alexandria, the commercial vacancy rate has stayed stubbornly high — 24.2 percent for Class A space, according to Costar, a commercial real estate research firm — but select areas are blossoming. Stephanie Landrum, director of the city’s Economic Development Partnership, says that the reconfigurement of the waterfront in Old Town is a bright spot. Work has begun on the Indigo Hotel, and developers of the Robinson South Terminal are getting together site plans and permits. At Eisenhower Avenue, next year’s arrival of the National Science Foundation is acting as a catalyst for office development and retail projects, plans that include a supermarket and a hotel. The area also is in contention to be the new home of the Transportation Security Administration. And at Potomac Yard, where residential building has been ongoing, the city has been working with the owner of a former industrial park to facilitate the transformation of the 20-acre Oakville Triangle site into 1.5 million square feet of mixed-use development. Landrum says that while the federal government always will be an anchor for Alexandria, the city is trying to attract more private businesses and nonprofits by making sure that old and new buildings alike are tailored to their rising demand for smaller, boutique spaces. Office tenants now expect the same amenities that residents seek, she says, and millennial workers, in particular, want to be in neighborhoods — preferably “authentic” ones as opposed to office parks. Like Alexandria, nearby Arlington County was heavily impacted by federal pullbacks, consolidations and relocations, and the effects of those actions will continue to be felt for some time. In the first quarter of 2016, the vacancy rate in Class A office space along the Rosslyn-Ballston corridor was 20.7 percent. Christina Winn, director of business investment for Arlington Economic Development, acknowledges that with more leases set to expire, office vacancies will remain “a bumpy road.” Still, she is optimistic that the pursuit of a “new way forward” will reap benefits. “We are going to be doing more national branding,” she says. Arlington had a presence at the SXSW technology conference in Austin, Texas, this March, and it also showcased itself as a location for IT businesses at the Consumer Electronics Show in Las Vegas in January. “A lot of tech companies are gaining traction [in the county],” Winn says. The shopping app Basket recently announced that it would move from the District to Clarendon. Silicon Valley’s Shift Technologies is bringing its East Coast operations to the county, and the clean energy company OPower is expanding its local operations. At GMU’s law school in Arlington, the thinking is not just national — it’s international. The new dean, Henry N. Butler, says the school is developing a master’s degree program in global anti-trust law and has state approval for a similar program in U.S. law aimed at foreign students. Also on the dean’s agenda is seeking permission from the state for a global degree program with classes to be held abroad. No doubt helpful to those expansion plans is the recent announcement of two gifts worth a total of $30 million to the law school. One gift, for $20 million, included the somewhat controversial request that the school be renamed in honor of recently deceased Supreme Court Justice Antonin Scalia. Like Alexandria and Arlington, Fairfax County, with its legion of government contractors, hasn’t shaken off the consequences of federal cutbacks. Office vacancy rate for Class A space stands at 18.6 percent in Greater Fairfax, although development near the new Silver line Metro stations in Reston and Tysons has been brisk. Two of NoVa’s biggest projects, the Capital One Campus and the Corporate Office Centre, for example, are under construction at the latter location. Still, Fairfax has learned a hard lesson, and, of all of the Northern Virginia jurisdictions, it is perhaps the most proactive in trying to diversify. “No one has to try harder, and we are not waiting until there are dramatic problems to act,” says Gerald L. Gordon, president and CEO of the Fairfax Economic Development Authority. He cites Fairfax’s facilitation of the arrival of the Inova Center for Personalized Health (ICPH) at the former ExxonMobil campus near Inova Fairfax Hospital as a prime example of the county’s can-change spirit. 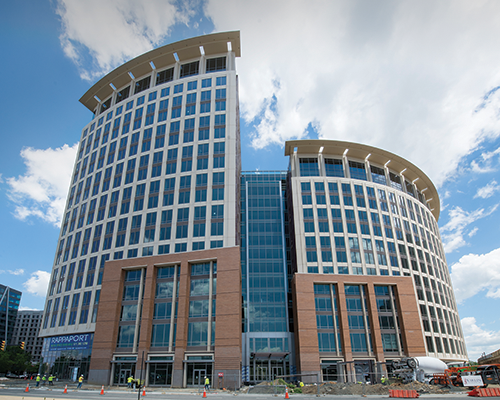 Inova took possession of the 117-acre campus in December, and it is working on reconfiguring the 1.2 million square feet of space in the five buildings that already are there. A clinic will open next year, and the Schar Cancer Institute will open in 2018. Also planned at the site are the Inova Translational Medicine Institute, a bioinformatics research center, a biotech innovation incubator, and a wellness and education center. Research at ICPM will be conducted with the intent to commercialize discoveries, and job recruitment for the center has begun. Stottlemyer expects that 3,000 people eventually will work there. Mach37 is another example of the new future envisioned by Fairfax. The cybersecurity accelerator, which takes its name from the velocity that rockets must attain to escape Earth’s atmosphere, is located at the Center for Innovative Technology in Herndon. It uses state and private funding to provide seed money, advice and even physical space to fledgling entrepreneurs. Just three years after its founding, managing partner Rick Gordon says Mach37 has helped 35 startups raise capital, find talent and develop business skills. “The deal is that they have to have a significant presence in Virginia within two years,” he says. Prince William County is pursuing a similar strategy of encouraging startups. 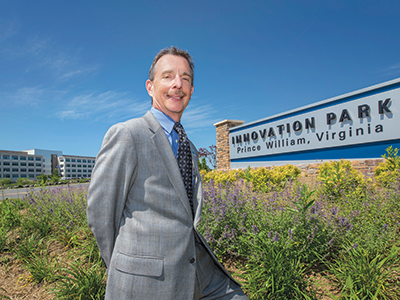 Jeff Kaczmarek, executive director of the county’s Department of Economic Development, says that at Innovation Park, adjacent to George Mason University’s science and technology campus in Manassas, seven of nine wet labs are active at a new science accelerator. The county is considering building similar facilities. The Virginia Serious Game Institute on the GMU campus also works with entrepreneurs to develop IT products with applications in areas such as health care and defense. Its establishment was a joint effort of the university, the county and the state. Additionally this year, the county opened its Regional Center for Workforce Education and Training in Woodbridge to promote the training of technicians in the fields of IT management, health care and cybersecurity. Data centers are “big capital generators” for his county, he says, and Prince William is pursuing more small and midsize companies, too. The insurer BerkleyNet will open a 70,000-square-foot facility at Innovation Park next year, and Virginia Railway Express plans three new stations in Prince William that should spur development. “We want to get above the noise of D.C.,” Kaczmarek says. In adjacent Loudoun County, the story is much the same. 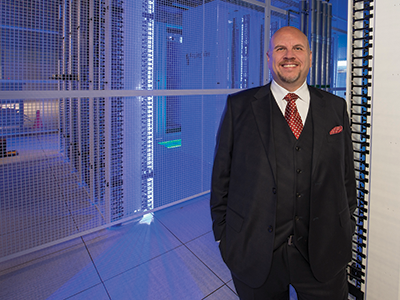 It has the largest concentration of data centers in the country — more than 60 — with more on the way. These data centers generated $104 million in tax revenue in fiscal 2015, says Buddy Rizer, director of the county’s Department of Economic Development. He expects that number to swell to $120 million this fiscal year. That means more aviation and logistics centers near Washington Dulles International Airport, more farm breweries in western Loudoun and more light industrial facilities along the Route 50 corridor. Loudoun is pursuing international business as well, and, in May, Rizer traveled to Germany where the county had a booth at a tech show. The arrival of Metro’s Silver line in the eastern part of the county in 2020 provides another opportunity to diversify by building more housing attractive to younger segments of the workforce. “We want to have an 18-hour economy rather than an eight-hour one,” Rizer says. Unfortunately, like all the other NoVa jurisdictions, Rizer’s county has yet to resolve two problems that affect its future prospects. First, infrastructure improvements such as the widening of the Beltway and the opening of Phase 1 of the Silver line have hardly dented the region’s terrible traffic: The only part of the country with worse congestion is Los Angeles. Second, the housing market throughout Northern Virginia remains spotty. The Northern Virginia Association of Realtors reports that sales were up 9 percent in April over March, however, only properties closer to Washington or with access to mass transit are selling well; those without those assets, are not. And even with prices suppressed in some markets, housing overall remains expensive. George Mason’s Clower says that companies contemplating locations in Northern Virginia can be put off by the prospect of their employees being unable to afford to live near where they work. Nevertheless, these negatives aside, the region is in a far better place than it was just a few years ago.